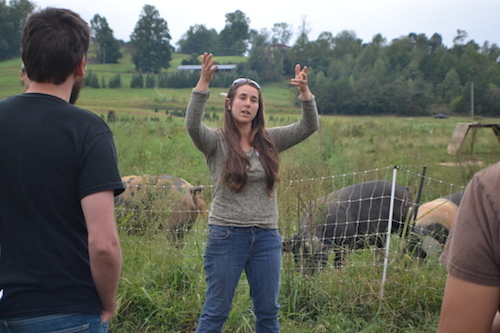 It was a beautiful day for our September CRAFT tour at Bluebird Farm in Morganton, NC. Three Season High Tunnels in the form of homemade Haygroves was our topic of choice for the day. Marie Williamson and William Lyons are the proud farmers of Bluebird Farm. In their fifth season, they are now growing 2.5 acres of produce planted twice each year, complimented by 12.5 acres divided between grass-fed sheep, and pastured pork & poultry, and partner with a family friend to raise beef cattle on an additional 25 acres. 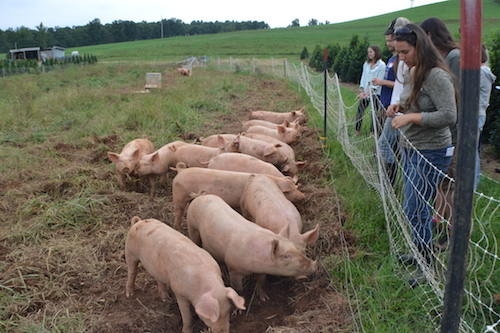 This year they received a WNC Agricultural Options mini-grant to start a farrowing operation and raised their first litters of piglets! Bluebird Farm is divided into two sections. They raise broiler chickens and some produce on 12 acres of family land, and have a long term lease on the 15 acres down the road at Silver Creek Farm owned by family friends. Silver Creek farm has been a nursery for decades, and as they phase out those crops it opens up land for William and Marie to potentially expand their production. Since Silver Creek Farm has been a working farm, it came equipped with farm equipment, irrigation, and a pump helping to minimize their start-up costs. William and Marie agree that this modification on the farm transfer to the next generation has helped them grow more quickly in five years and been a tremendous asset. But, trying to grow vegetables on land used to grow landscape plants brings its own challenges via nutrient depleted, sandy soils low in organic matter. As they continue to raise their soil quality by integrating livestock with their vegetable production they also have had to look at ways to maximize efficiency on what they produce. That’s where homemade Haygroves come in. Haygroves are a three season high tunnel developed by the Kerr Center and are relatively inexpensive costing less than $1000 to put up. Bluebird’s main motivation for using high tunnels was to improve their tomato production since they were throwing away 50% of their field tomatoes due to cracking and disease. So they went about adapting the Kerr Center plans to fit their needs, the supplies they had access to, and the WNC region. First, they added in-ground legs for increased ventilation and to fit their tractor inside. For three of their six haygrove tunnels they re-used greenhouse bows for the arches, and each one takes about 40 hours to install. Contrary to typical high tunnels, haygroves use ropes to hold the plastic on and only wiggle wire on the two ends of the tunnel. While the Kerr Center plans use one continuous rope, William and Marie have found that a 60 ft. rope for each arch pole makes it easier to tighten down the plastic, and if one rope were to come off they wouldn’t lose all the ropes. While these are not meant to withstand winter snows they are an inexpensive and labor saving option for a semi-permanent high tunnel option. William and Marie also shared their lessons learned after working with haygroves for several years. While they no longer have to throw away 50% of their tomatoes due to cracking they do have to battle with leaf mold now. Fertility is a continual challenge as well since they are growing tomatoes in the same soil each year. To combat soil depletion they add compost and nutrients before planting and fertigate with fish emulsion through the irrigation lines throughout the season. Also, after a freak storm with extremely high winds hit the farm, collapsing one tunnel completely, ripping the plastic, and bending poles on several others, they will be sure to use the recommended trailer home anchors that secure both ends of the tunnel. After thoroughly exploring the haygroves we visited the sheep flock, laying hens, the mama sows and the growing piglet litters we gathered for a delicious potluck. A great end to a great tour! Thank you to William, Marie and their farm crew for hosting us and being so willing to share your challenges and successes. We learned so much. Until next time! 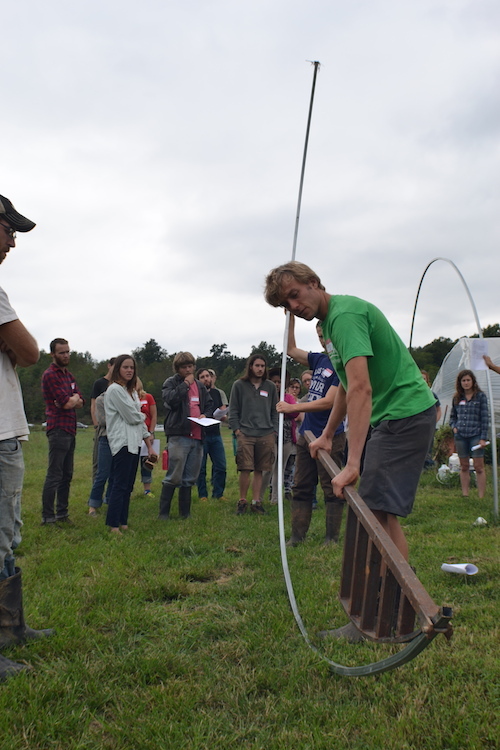 CRAFT is a year-round farmer training collaborative that offers farmers and their interns networking and learning opportunities. Membership is rolling, so join anytime! For more information or to join, click here. 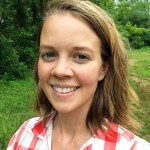 Or contact Cameron Farlow, Organic Growers School Farmer Programs Assistant at 828.338.9465 orcameron@organicgrowersschool.org.